Modeling is one of the most misunderstood of the Next Generation Science Standard’s Science and Engineering Practices. Don’t think so? Consider how many times you have seen, done, or assigned yourself the “edible cell” or the “Oreo cookie moon phases” or even the “biome in a box project.” We assume that models must be three dimensional, that they are simply representations, and all too often, our models just become art projects. In the world of the NGSS, models are both more simple and more complex than what I described above. A model could be a simple sketch or drawing, or a model could be an elaborate setup. The key thing with NGSS models is that they are used. They are used to explain something or to predict something. What is that “something” they are explaining or predicting? Phenomena. Phenomena, put very simply, are observable events that we can use scientific knowledge to explain or predict. A phenomenon could be a spike in the snowy owl population one year, or it could be an overfilled water bottle expanding and breaking when frozen. Read more about using phenomenon in NGSS classrooms here. Modeling in the NGSS classroom can be used to explain phenomena and demonstrate a student’s understanding of the concepts learned, or modeling can be used to discover the concepts themselves. Models can even be used to generate questions and drive a storyline forward. 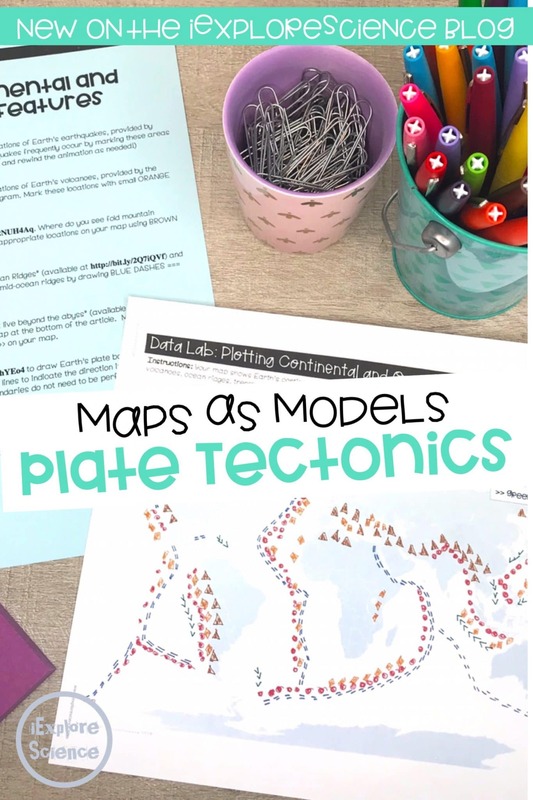 In my own classroom, I have tied the practice of Developing and Using Models to Analyzing and Interpreting Data to guide student discovery of the connection of plate tectonics to Earth’s surface features. One of my favorite activities engages students in a webquest of sorts, where students visit different resources to gather data on the locations of relevant landforms and observable features. They use these resources to plot the locations of earthquakes, volcanoes, mountain chains, trenches and ocean ridges, compiling all of this information on a map. Then, they essentially overlay this map with Earth’s tectonic plate boundaries, creating a tie between the surface features and the plate boundaries. Initially, students use this model to develop an understanding of the big disciplinary concept — that plate tectonics is responsible for most of Earth’s surface and ocean-floor features and the distribution of rocks and minerals within the crust. They can draw conclusions about the types of features that are found at each boundary type. While the analysis workshops I include guide students through this thinking, we also spend time discussing their observations and using those to make meaning of the map together during our Explain phase. Students document observations and conclusions directly on their maps, keeping it all in their notebooks. Through this initial Explore and Explain sequence, students use evidence to tie together Earth’s surface and ocean-floor features and the theory of plate tectonics. The key to working with NGSS-style models is to truly work with them. Use them. The focus is really on the process and not the product, which is a whole lot different than those Jello cells or Oreo cookies. What are your favorite NGSS-style modeling activities? Share them below or tag me on Instagram! I would love to see some pictures of how you are using NGSS models in your classroom.